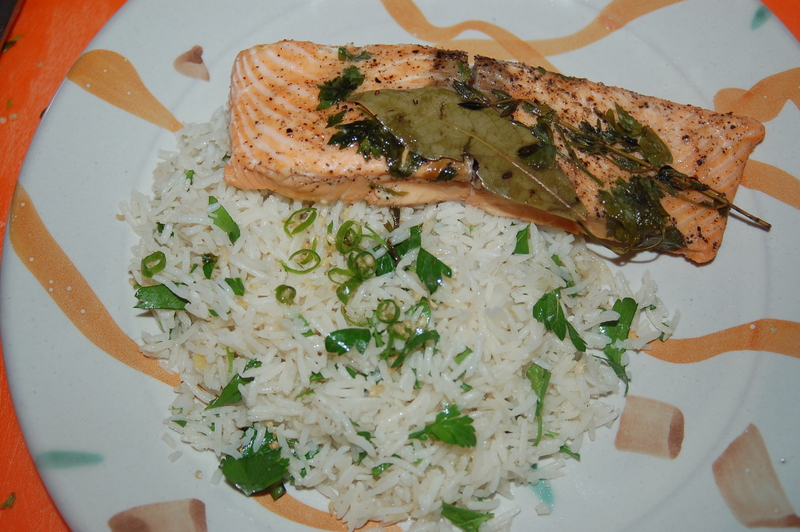 Salmon Baked in Foil with Parslied Rice (Serves 4) | Crappy Kitchen - Good Dinners! This was a dinner I made in a hurry. I was low on everything imaginable and was not going to be going to do any major shopping until Sunday. At times like these I reflect on how the freezer was such a great invention! My freezer is tiny (just part of my fridge) but it is invaluable. I have learned an awful lot about spacial relations while trying to pack the freezer from numerous overenthusiastic shopping sprees! If you take things out of their package and wrap them individually or, into smaller parcels, you can cram every nook and cranny with food. The food in my freezer sometimes acts as my emergency supply of food when the cupboard looks reminiscent of Old Mother Hubbard’s. 2 fresh Thai chilis (optional). 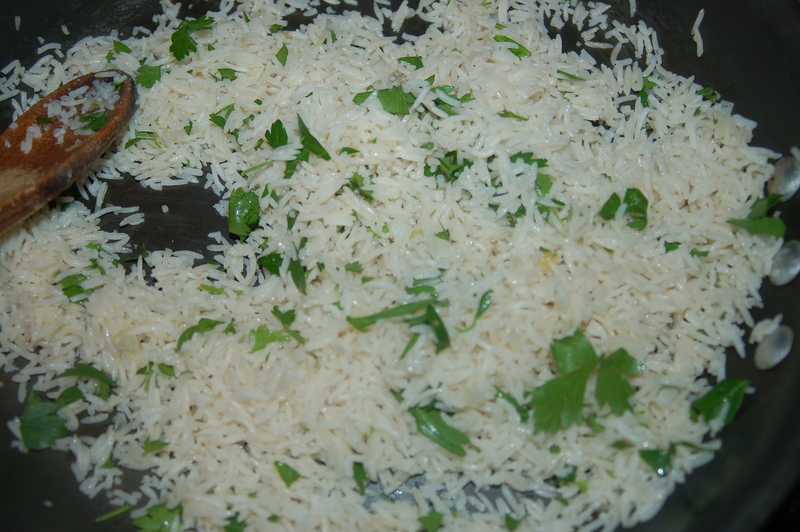 1 – Cook rice on stove top or in rice cooker according to instructions. Keep warm. 2 – Take a piece of foil and double it. It needs to be big enough to make a loose parcel with 1 piece of salmon. Butter each piece of foil with 1/2 tbs butter and lay the salmon in the middle. Do this to all four pieces. Season with salt and pepper. 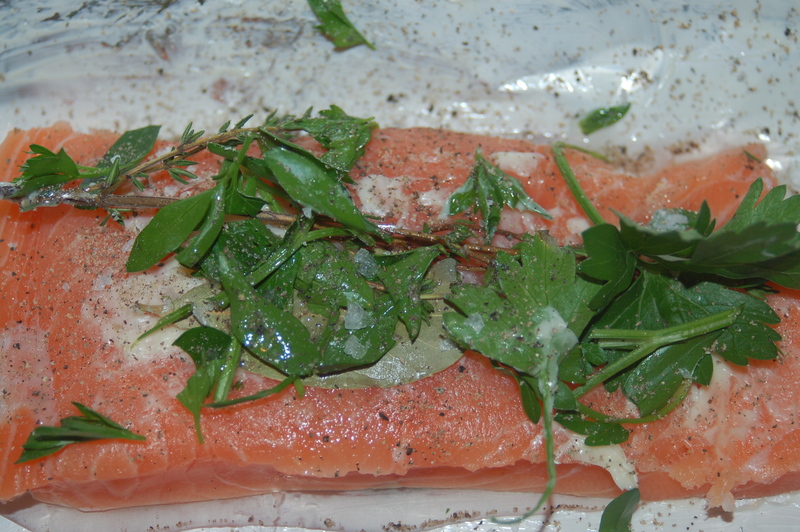 Lay a bay leaf, thyme sprig, 1/2 tbs parsley on each piece and turn up foil around edges of fish, but do not close. Add 1 tbs of wine to each fish and then seal loosely so that there is still an air-space in the packet. Place on baking tray and bake in oven for 10 minutes. Add chilis, parsley and juice from salmon to rice..
3 – Scoop out 4 cups of warm rice and mix with 2 tbs chopped parsley and Thai chilis. When fish is cooked, open the parcels carefully and pour the juice from the fish into the rice and mix. Taste rice and add salt and pepper if you think it needs more seasoning. This was light and wonderful.. Put rice on a plate and lay fish on top. This entry was posted in "Blood Type A " Recipes, dinners and tagged baked salmon, blood type A dinner, blood type A recipe, fish in a packet, fish in foil, parsley rice, rice, salmon, salmon in foil. Bookmark the permalink.